Over the years we have created many different advent calendars. You may recall the year when my sister lived over seas and sent my daughter a surprise in the mail every day. One of my favourite advent calendars was last year’s eco-friendly calendar…get those kids outside on chilly days and nights. Don’t forget about our joke packed toilet paper roll elves…a new joke everyday! This year we decided to add a sweet twist to the countdown with a Christmas cookie advent calendar. Yep, an advent calendar filled with Christmas cookies! How delicious is that? The first step is baking the cookies. 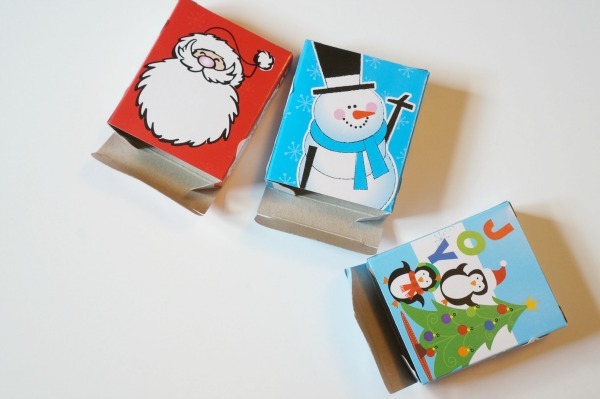 You will need small cookie cutters so that the cookies will fit inside a match box, or similar sized box. Cream together butter, sugar, egg and vanilla. In a separate bowl whisk together flour, baking powder and salt. Add dry ingredients to wet ingredients in 3 batches. Stir until dough comes together. Form disk with dough and wrap in plastic wrap. Refrigerate for 20 minutes. Roll out cooled dough on a lightly floured surface, roll to 1/8 inch thickness. Cut out shapes. Bake in 350°F for 8-10 minutes…until lightly golden on bottom. Set aside to cool on rack. 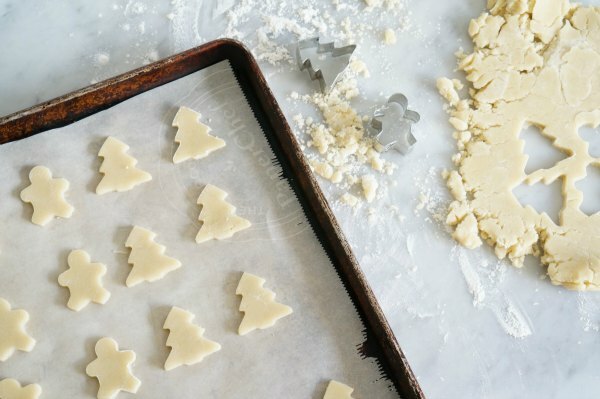 Mix up a batch of royal icing. Combine icing sugar, meringue powder and water until icing reaches desired consistency. If you want to pipe on cookies, keep the icing thick. Divide icing into 3 bowls and add red and green food colouring. Transfer icing to resealable plastic bags and clip the corner…create a very small hole. The smaller the hole, the thinner the piping. 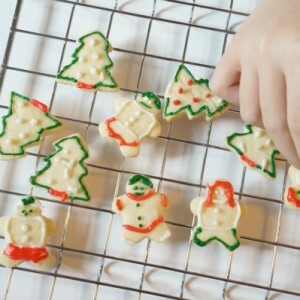 Decorate the cookies and set aside to dry completely…about an hour or two. My daughter did all the cookie decorating. I love her little trees and gingerbread people. Prepare the boxes for the cookies. We found our boxes at the dollar store, they were filled with little stickers. My daughter used the stickers to decorate the sides of the boxes. Look for boxes that fit the size of your cookies. I simply used a marker to write the numbers 1 thru 24 on the bottom of each box. We loved the funny designs on the boxes and didn’t want to write on the designs. Cut 24 pieces of decorative string about 4 inches long. 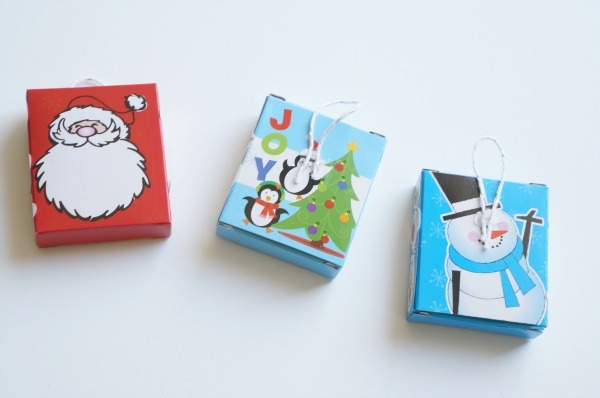 Use a dot of glue from the glue gun to adhere a loop of the string to the back of the boxes. If you don’t have a glue gun, a piece of tape would do the job. This is how the boxes will hang on the cork board. We used a cork board that we already own, but you can purchase a cork board from the dollar store. Wrap the cork board like a present, with festive wrapping paper. Once the icing on the cookies has dried pop the cookies inside the resealable plastic bags. We used little craft bags, again from the dollar store. The bags need to be sealable to keep the cookies fresh for the entire month. 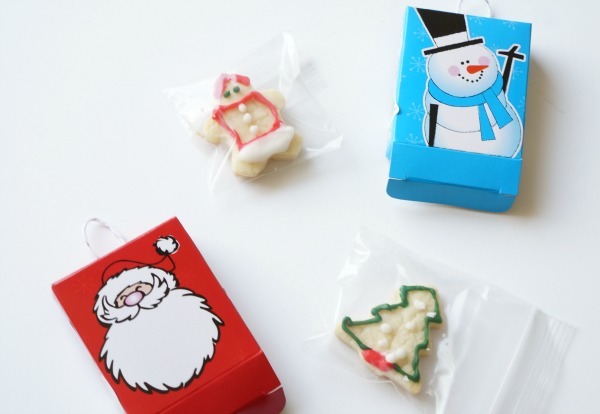 Slide the wrapped cookies into the boxes. Okay, now it’s time for the layout. My daughter and I worked on the design…a Christmas tree. Layout the boxes and use the push pins to attach the boxes in place on the board. Done! Hang the Christmas cookie advent calendar and enjoy all December long. One of the best things about this advent calendar is that I am already planning what we can fill the little boxes with next year. The entire calendar is reusable…we love that. Countdown to Christmas with a Christmas cookie filled advent calendar. Fun and delicious! 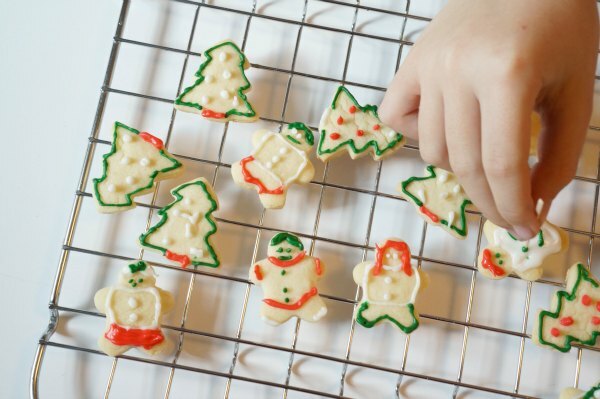 Decorate the cookies and set aside to dry completely…about an hour or two. Oh my goodness, I love this idea! I might have to start this with my toddlers! Now this is my kind of advent calendar never mind the kids! Right?! Don’t be afraid to make a separate one for mom! Yum! Who wouldn’t want a cookie calendar! I might have to get going on this one. This is just the best idea! My kids would LOVE it! OH those cookies are so cute! I love the boxes as well. WONDERFUL – swapping out of chocolate coins this year and will use this idea in our quilted calendar. Although I may have to include 4 cookies per day to satisfy all of the family! OMGoodness! I doubt these will last in my house for a count-down but we sure would have fun making them. 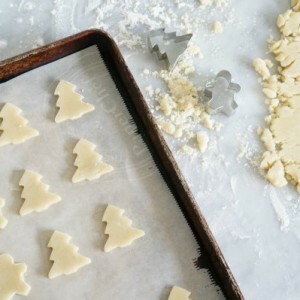 Love this sweet twist to the countdown to Christmas. The cookie recipe sounds great! Yum! 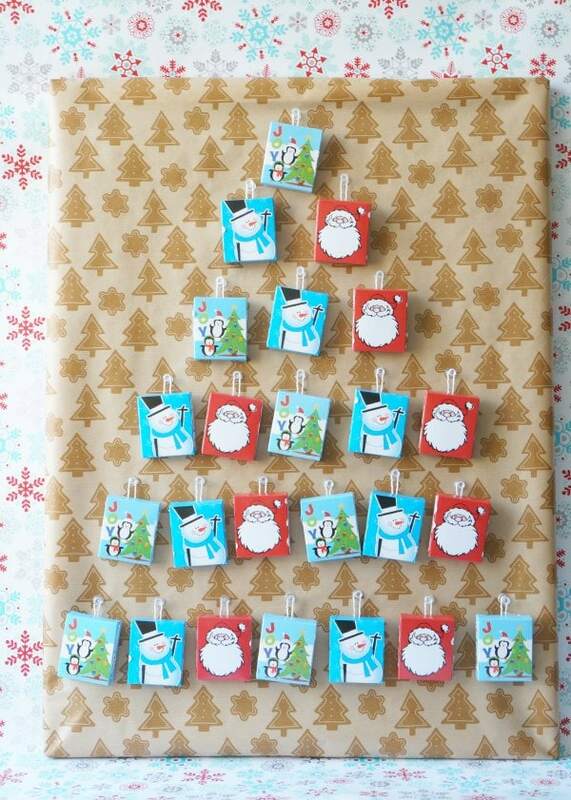 What a sweet idea for an advent calendar! I love the layout and colors of your Advent calendar (and the lovely little cookies, too)! Oh my those cookies look so yummy – what a great idea! 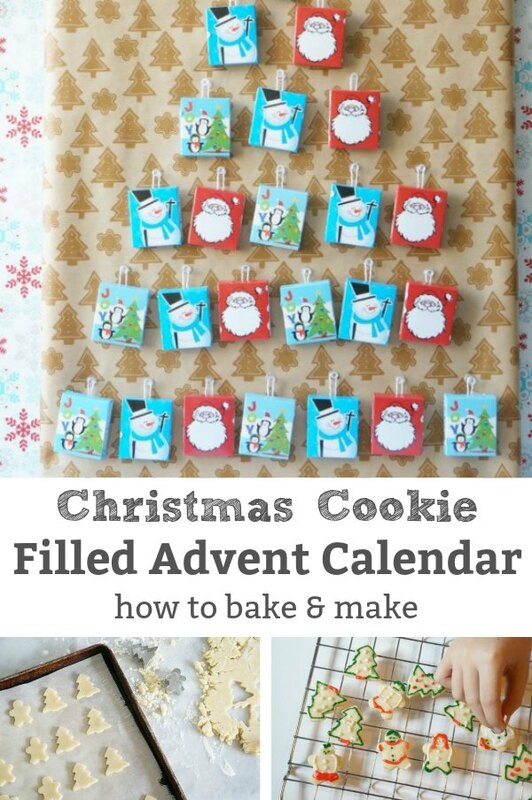 We love this advent calendar and the cookies do look very cute!